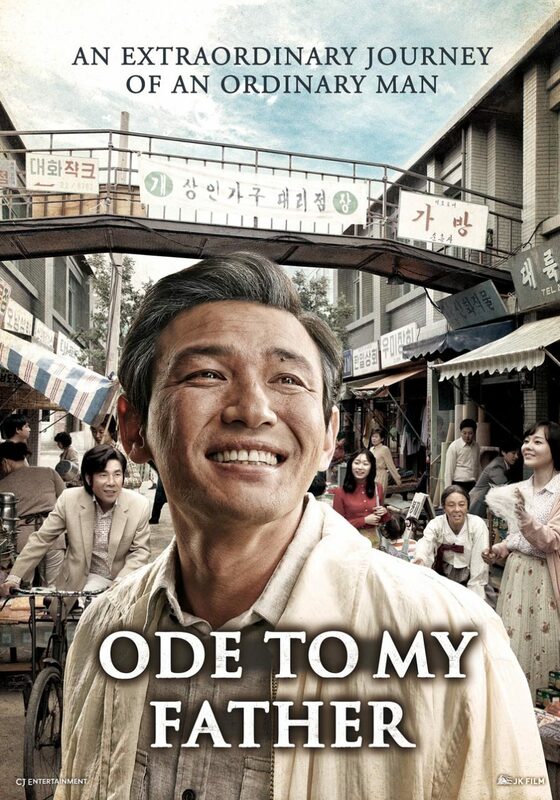 Learn about South Korea's history through Ode to My Father, a touching Forrest Gump-like story of an ordinary man who experiences extraordinary events. The movie’s English-language poster, featuring an aged Yoon Deok-soo. If you’re American (or even if you’re not), you’ve probably seen Forrest Gump. Maybe you’ve even watched it in a high school history class, where your teacher pointed out all the historical references — Civil Rights, the Vietnam War, Watergate, AIDS, and more. Forrest Gump appeals to Americans because it tells their stories, both as individuals and as a nation. You could say Ode to My Father is South Korea’s Forrest Gump. Through the eyes of an everyman named Yoon Deok-soo, it chronicles 60 years of the nation’s history, starting with the Korean War. Released in December 2014, it quickly became the country’s second-highest grossing film of all time, owing to audiences looking for a trip down memory lane. Like Forrest Gump, it’s touching, full of humanity, and, most importantly, replete with historical references that form a quintessentially “South Korean” narrative. If you don’t come from a Korean background, you can still enjoy the film from its poignancy alone — but it’s just so much more powerful with historical and cultural context. Therefore, were here at Cinema Escapist have put together a guide to help more general audiences understand the history behind Ode to My Father. Let’s get started. Note: Some spoilers ahead — but nothing that’ll impede your enjoyment of the film since its strength is built more on drama than suspense. The SS Meredith Victory as depicted in the movie. Ode to My Father‘s first flashback takes us to December 1950. Our everyman protagonist Yoon Deok-soo is just a boy, and he’s struggling amidst a horde of refugees to get aboard an American ship called the SS Meredith Victory. At this point during the Korean War, Chinese soldiers have pushed United Nations forces (who swept deep into North Korea — and too close to the Chinese border — after the Inchon landings) into a retreat. As a result, 100,000 soldiers and 100,000 civilians evacuated southwards from the port of Hungnam, similar to how British and French troops evacuated Dunkirk during World War II. During the Hungnam Evacuation, a single American cargo ship called the SS Meredith Victory, which was only meant to carry 12 passengers and 47 crew, took on 14,000 refugees. That’s right, 14,000. What’s even more amazing is that all 14,000 survived the three day journey to Busan, despite the fact that they were crammed like sardines and had little food/water. To this day the Meredith Victory continues to hold the Guinness World Record for “the largest evacuation from land by a single ship”, and it’s become known as the “Ship of Miracles”. Mr. Chung comes for a shoeshine. After evacuating to Busan, Yoon becomes a shoeshine boy. In one scene, he shines the shoes of a dapper man named Mr. Chung, who talks about how he wants to build ships and make Korea rich. After the shine, Mr. Chung leaves on a truck marked 現代 — the Chinese characters/Hanja for “Hyundai”. Sound familiar? Mr. Chung is none other than Chung Ju-yung, the founder of Hyundai Group, South Korea’s biggest chaebol (conglomerate). Born into an impoverished family in what is now North Korea, Chung made several failed attempts at entrepreneurship before founding Hyundai as a small construction firm in 1947. During the Korean War, Chung fled to Busan and began to pursue construction contracts from the United Nations forces. After the war, Chung continued to build and diversify Hyundai into areas like car manufacturing and, yes, shipbuilding. True to his shoeshine dreams, Chung Ju-yung ended up building a huge shipyard in Ulsan; today, Hyundai-affiliated shipyards build more vessels than anyone else in the world. Conglomerates formed the backbone of South Korea’s economic miracle, and Hyundai was leader of the conglomerate pack. From 1947 until his death in 2001, Chung Ju-yung made an indelible impact on South Korean history. By growing his simple construction firm into one of the world’s largest companies, he really did help “make Korea rich”. To pay for his brother’s tuition at Seoul National University (South Korea’s best university), Yoon Deok-soo signs up to work as a miner in Germany. There he meets his future wife Young-ja, who’s working as a nurse. During the 1960s, West Germany began to recruit South Koreans as gastarbeiter, or guest workers. Both economics and politics drove this decision — West Germany’s economy was growing and needed cheap labor, and its government wanted to show solidarity with South Korea as a fellow nation divided by the Cold War. The Germans exclusively recruited men to be miners and women to be nurses. Between 1963 and 1978, around 8,600 miners and 10,400 nurses went to Germany on multi-year contracts. As depicted in Ode to My Father, competition for these slots was fierce and working conditions were tough. In 1963, only around 12% of mining applicants obtained, and those who did make it had to deal not only the inherent dangers of mining, but also cultural and language barriers. Just when you think Yoon Deok-soo is done with going to foreign countries to fund his siblings’ endeavors, we discover that his sister needs money for a wedding. So what does Yoon do? He goes to Vietnam as a civilian contractor. We oftentimes see the Vietnam War as a conflict between the South Vietnamese/Americans on one side and the North Vietnamese/Viet Cong on the other. However, what’s less known is that many other nations were involved in the conflict, including South Korea. Between 1963 and 1975, South Korea sent 312,853 troops to Vietnam, making it the second-largest foreign contributor to the war effort after the United States. Why did South Korea participate? Again, politics and economics. Politically, South Korea wanted to maintain a staunch anti-communist image to support both allies abroad and the government at home. At the time a military dictatorship ran the country, and engaging with a clear and present communist dangers was a great way to justify authoritarian rule. Economically, helping out the US meant getting massive amounts of financial aid in return — something South Korea desperately needed during the 1960s (during which its economy was actually not much better than North Korea’s). Vietnam also became a proving ground for Korean exports and construction companies who wanted to score American contracts. These companies recruited contractors (like Yoon Deok-soo) with the promise of generous wages; most of those wages and the companies’ profits ended up going back to stimulate South Korea’s economy. The economic aid South Korea received for sending troops to Vietnam helped catapult it towards prosperity. However, the war’s political legacy is more mixed. Like in the US, it’s become South Korea’s “forgotten war“, something that people feel shameful about or are reluctant to relive. If you want to be cynical, South Korea traded blood for money in Vietnam — and that’s not something that inspires a lot of pride. Yoon in a KBS studio. One of the Korean War’s most tragic legacies is the separation of millions of families. Because territory changed hands so many times during the war, some family members were trapped behind enemy lines or unknowingly scattered to different corners of South Korea with no way to communicate. Ode to My Father‘s Yoon Deok-soo bears his own piece of this tragedy– he was separated from his father and younger sister during the Hungnam Evacuation’s chaos and yearns to find them. In 1983, he gets an opportunity to try. That year, KBS (South Korea’s national broadcaster) launched a program called “Finding Dispersed Families“. The program let individuals searching for lost family members to describe who they were looking for on live TV (with the help of a written placard); anyone within South Korea who thought they were a match or knew of some leads could call a hotline. If there was a match, the family members would be brought together on another broadcast for a tearful reunion (sample reunion clip here). KBS initially only expected to handle about 2,000 cases, but the program became so massively popular that over 100,000 people applied to appear on broadcasts and massive crowds formed near KBS headquarters in Seoul (on Yeouido, near the National Assembly), holding up their own placards of loss. Between June and November of 1983, the program helped unite 10,189 families and at one point captured 78% of total television viewership in the country. The popularity of “Finding Dispersed Families” highlights how even decades onwards, the Korean War and its legacy of separation still holds massive sway over South Korea’s national consciousness. Family reunification, especially with members in the North, remains a potent political issue, and South Korea has actually submitted the archives of “Finding Dispersed Families” for preservation with UNESCO. Ultimately, the program struck an emotional chord with the nation; it was a tangible reminder of just how personal the tragedy and loss of war can be. Like the four other items we’ve chosen, the KBS family reunions were both emotionally charged and culturally significant. All five of these historical snapshots highlight the sheer tragedy, sacrifice, and perseverance that brought South Korea to where it is today; they exude the blood, sweat, and tears that went into writing South Korea’s national narrative. If Ode to My Father is a film that tells the story of a nation, we can appreciate it so much better if we understand just how difficult that story was to write. Ode to My Father (Korean: 국제시장)— South Korea. Directed by Yoon Je-kyoon. First released December 2014. Running time 2hr 7min. Starring Hwang Jung-min, Yunjin Kim, and Oh Dal-su.